After a disappointing lack of hexipuffs in yesterday's post, you can see that I haven't been completely idle over the last week. The beret and collar, both stashbusting projects, are almost done so you'll be able to see them on Friday - both are from great free patterns and would be suitable as a first knitted hat or a first crochet project in my opinion (perfect for when the kids are home). Nuvem is getting big but I can't see quite how big due to the small cable. I've been trying not to knit it as it'll make a perfect holiday project - light, packs up small and isn't too hot on a lap in high temperatures but I may add a couple more rounds and then transfer to an extended cable so I can get a better look at it. Last week I finally finished reading Two Cows and a Vanful of Smoke by Peter Benson, and I didn't really enjoy it. I kept reading in the hope that it would get better but it felt like it was lacking something - more like a first draft than a finished novel and it left me disappointed that I'd stuck with it until the end. Not so my latest read, The Earth Hums in B Flat which is much more enjoyable. It's told from the point of view of ingénue Gwenni who is growing up amongst a Welsh village of interesting and well drawn characters. There is an element of mystery (a missing villager who shares some unknown past with her mother) a sense of other-wordliness (Gwenni is convinced she could fly as a baby) and if I had the chance I wouldn't put it down until it's finished. Sadly that's not an option! The other book to have arrived from Amazon is for our book club. I haven't read any Allende and am looking forward to getting into The Sum of Our Days, however it's not available on Kindle and the paperback I bought (second hand) has really small text and I've managed only a few pages so far - once I've finished the other book I'll set aside an evening for it. Well that's it for today. The children and I are going to a friend's garden to enjoy the sunshine and some splashing about in water. It's so nice to finally have some summer - we've waited a long time and endured much rain to get to it. When I get back I'll be visiting the links at Tami's WIP Wednesday and Ginny's Yarn Along to see what everyone is making and reading. Enjoy your day! oh sorry forgot to say nice beret too! The collar is so lovely! 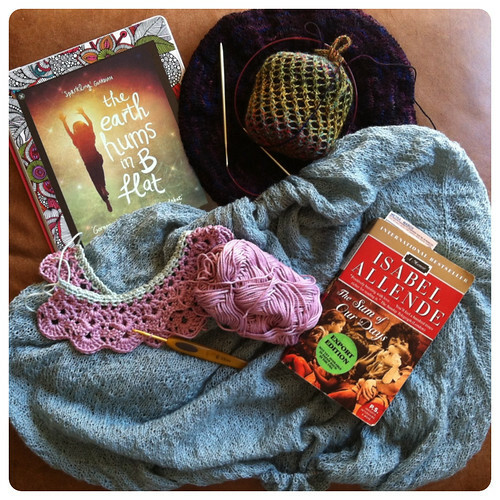 Knitting, crocheting, and reading? Boy, you are busy! Ok, ok - that's yet *another* beautiful crochet collar... I am resigned to making one myself, now - i've seen so many lovely ones. I'm glad to hear someone else is enjoying "The Earth Hums in B Flat": I really loved that book - unique and charming. Cute little Peter Pan collar - that'd dress up a couple of utilitarian blouses I have very nicely! What great projects you've got goin' on there and interesting books you're reading :O). I just love the peter pan collar! With all you've done don't sweat a few hexipuffs! I'm sure you'll sneak them in. I really like the collar. What do you think you'd wear it with? a button down shirt or a pullover style? They're cute and I'd really like to be able to add something like that to my wardrobe, but I'm fearful - I'd love to see what you pair it with! Isn't it disappointing when a book just never pulls it together?! At least you're on to better things. For myself I'm going to make a black one, as I have a few plain black and grey wintery tops that might be a good match, although I do think it would be cute with a tshirt too. Seems like the collar is popular!!! It's finished now and I LOVE IT! Can't wait to share it on Friday!!!! The collar is gorgeous - well done on the stash busting. Gosh you're going some with the knitting these last few weeks Sarah. Since joining YOP I've realised just how low my knitting output has become. There's a million reasons for it but every time I read a post like this I get knitting envy. Think I might sit outside later and try and finish that hat!